Hi, I have a Hyper 212 Evo with a i5 4670K at 4GHz and I'm getting around 78-80C on load with FMA3 version of Prime95. Is that normal? What are your ambient temps and CPU voltage? 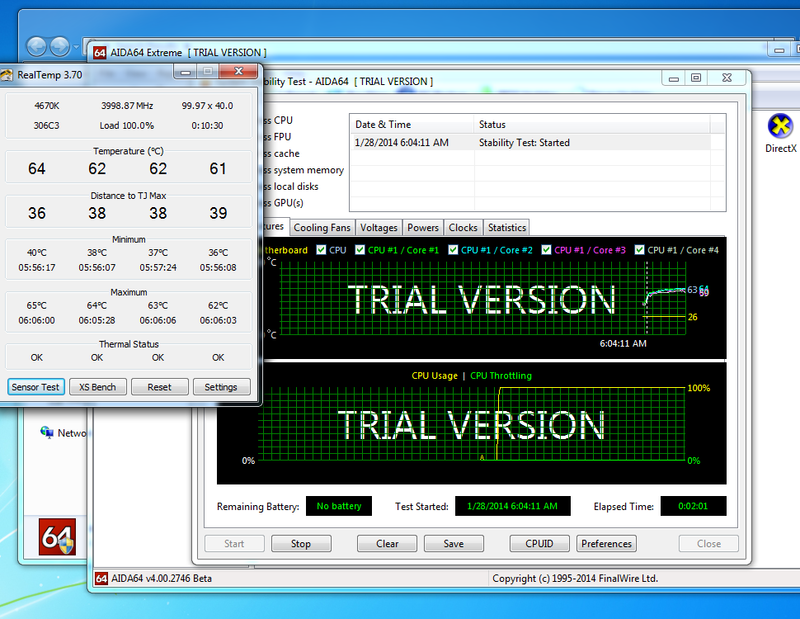 Those temps are very high for such a low overclock. 20C inside case, 4 GHz at 1.15V, tried reseating heatsink, with "official" Prime95 (AVX) I'm getting around 68-69C. Higher with the FMA3 version. BTW, I have Arctic Silver 5. I'm just not sure what to expect with this cooler. Where are your load temps after say only 2-5 minutes? We just happened to be discussing this in a similar thread, but I have the same chip as you and it is currently at the same speed, but with the stock cooler. Yeah, 68-69 sounds about right. I have my 4770k at 4.1GHz @ 1.185v temps get up to about 70*C (cpu mining at full load) with slightly warmer temps in the case because I also have two non-reference cards (7950 and 7850) mining which blow all the hot air inside the case. I am using CM Hyper 212+ with only one fan and AS5. Just turned on prime miner, temps are 61*C after less than 5 min of mining. You really shouldn't expect much from a CM Hyper 212... Adding a second fan doesn't help much either. It may lower your temps by 1-2*C but it's practically useless since the heatsink itself barely gets warm to the touch. This is with Prime95 27.9. 28.3 gets around roughly 10c hotter..
AIDA64.. doesn't get that hot.